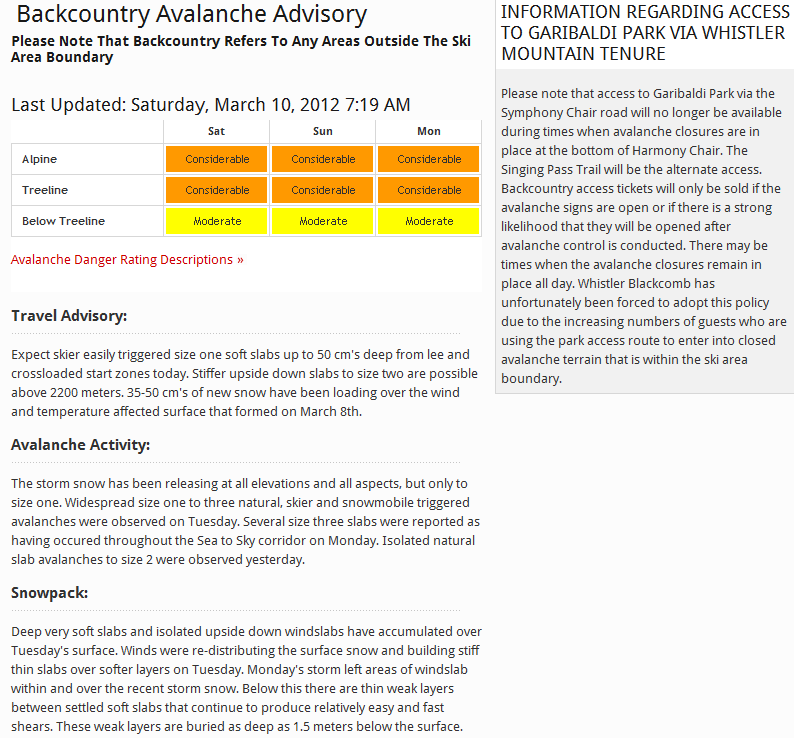 I’ve noticed a discrepancy between the Whistler/Blackcomb avalanche report and the one published by the Canadian Avalanche Centre. Since Whistler/Blackcomb doesn’t let me “permalink” to the bulletin, if you read this tomorrow you probably won’t see what I am seeing, so I’ll include a screen capture (I consider this “fair use” under Canadian copyright legislation since it’s for research, study and criticism). The CAC has in fact issued a special public avalanche warning for this weekend; one that seems to have been necessary since there’s already been two reported incidents, one with a fatality, the second this week. If you look at the past few bulletins for the Sea-To_sky region (which contains the Whistler/Blackcomb) you can see that it’s been pegged at High, with many reported size 2, 3 and even several size 4 avalanches observed during the reporting period. This discrepancy is odd, since in theory the CAC uses data submitted by Whistler/Blackcomb, ski hills, and other observers through the InfoEx system to create the bulletin. While some may not consider this to be a big difference, the CAC specifically mentions the hazard being unusual, widespread and currently at all elevations. The definition of “High” from the CAC is that natural avalanches are likely, human triggered avalanches are very likely. 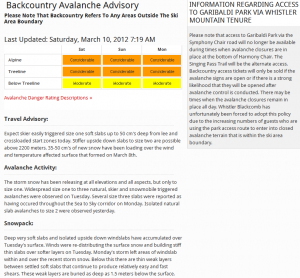 Given that natural and human triggered avalanches are being reported at all elevations and aspects in both bulletins, I would think the hazard reported in the Whistler/Blackcomb bulletin should be the same as the CAC, and set at High. Does anyone know if there’s a reason for this? No idea, but it seems like the author of http://www.wayneflannavalancheblog.com/ would be a good person to ask. Seems to be back in line now. Could be that the backcountry in the area surrounding the ski hill is more compacted as it sees more traffic. It could also be due to it’s location: as the whistler area is behind a few ranges from Howe Sound and sees less precipitation.